Back in the days of the long bow, calculating kinetic energy was pretty important. Modern compounds and arrows have virtually eliminated the worries about having enough kinetic energy to ethically hunt big game. That doesn’t mean it’s not valuable information. Kinetic energy is a major factor in arrow penetration. Penetration is a major factor in how lethal the arrow is. Simply stated, kinetic energy is the result of an arrow’s weight and speed. Those elements are what is needed to calculate kinetic energy. For example, my bow fires a 400 grain arrow(broadhead included) at 305 feet per second. To find the kinetic energy, I multiply 305 by 305, then multiply by 400. I get 37,210,000. Divide that by 450,240 and the kinetic energy is 82.64 ft. lbs. I suggest using a calculator. Figuring this out on a napkin would get pretty messy. So you’ve figured out your kinetic energy. Now what? Contrary to the belief of many, you really don’t need much energy to kill a deer… if the arrow is placed well. This is why most of the time you will recover your arrow in the ground right where the deer was when you shot it. You only need about 25 ft. lbs. 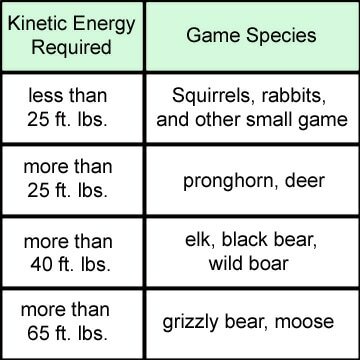 of kinetic energy to ethically hunt deer. From the above example of a common, modern day compound bow you can see that most hunters are way over the 25 pound mark. My 12 year old nephew’s youth bow shoots just under 200 fps. So at 195 fps with a 360 grain arrow & broad head combo, he is still getting about 30 ft. lbs. of kinetic energy, more than enough to do the job. Keep in mind that as an arrow travels further from you and your bow it slows down. This will affect kinetic energy. An arrow will have more kinetic energy at 35 yards than at 50 yards. But kinetic energy is not the only determining factor of arrow penetration. The type of arrow, broad head, and friction are also going to come into play. Carbon arrows are typically more expensive than their aluminum counterparts and in my experience, they are well worth the money. They won’t wobble as much when leaving the bow and there is significantly less wobble when the arrow meets it’s target. That means more of the arrow’s energy is focused on the point of impact, thus creating deeper penetration. Carbon arrows are typically thinner than their aluminum counterparts, which also leads to less friction at the point of kill and deeper penetration. The type of broad head you use is also going to affect penetration. A two blade broad head, like the Rage, will likely penetrate better than it’s three or four blade counterpart. Also, fixed blade broad heads typically penetrate better than mechanicals. However, just about all of them will easily pass through a whitetail with ease when you consider the kinetic energy of most modern compounds. In my opinion, more penetration just means your arrow will be deeper in the ground when you go get it. A three or four blade broad head with a wide cutting diameter will offer plenty of penetration while providing a wider wound channel and better blood trail. Friction is another element to think about. If you have ever shot arrows into different types of targets, you will notice that some targets stop arrows faster than others. This is friction. When it comes to animals like deer, there isn’t much friction produced if arrow placement is through the ribs. An arrow fired with modern equipment will easily penetrate through the soft tissue and out the other side. f you’re shooting well above the recommended kinetic energy and have a deep penetrating arrow & broad head combo, your arrow may still reach the vitals but stay in the deer. This will likely kill the deer but make tracking and recovery a little more difficult since the blood trail will be lighter. There is also something to be said about having sharp blades. Great fisherman never fish with dull hooks and great hunters shouldn’t use dull broad heads. Every time your broad head passes through something, whether it is a target, an animal, or the ground, the blades become more dull. I practice with field tips, but like to shoot a few broad heads before the season just to see how the arrows react with them. I usually keep those broad heads for the rest of the season but the arrow I nock first has fresh blades. I can always tell the difference by putting a lighted nock on this arrow. Using this system makes it easy to recover the arrow and assures me that I’m firing a sharp broad head. 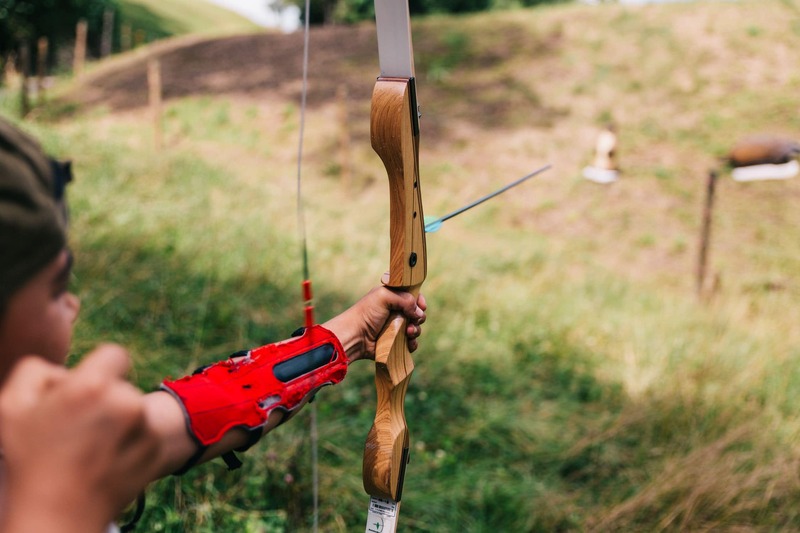 Most of the worries associated with kinetic energy and penetration stem from traditional archery equipment. Even traditional archers have plenty to work with as long as they limit the distance of their shots and hone their skills. For compound archers, it comes down to arrow placement. There really isn’t a modern compound bow/arrow combination that doesn’t have all you need to effectively kill a whitetail deer. Spend some quality time at the range and the mathematics will take care of itself.